The staff was great! There was only one staff member working at the time we checked in, but we were the priority and she was very efficient at giving directions for checking in/out and getting us on our way. It was great! Above expectations. The complimentary gift was also a nice touch! Check in & out was friendly and easy. We also loved the extra touches of the mugs, coffee, and dog treats (although we didn't use the dog treats it was nice to have them just in case). Over all the place was nice, staff was nice and experience was good. Nothing was broken or missing. We're not upset about the few items that need to be cleaned better, just want you guys to know so you can improve. We have stayed in Cannon Beach many times and have noticed the difference between your company and Vacasa. We will always try to book with your properties instead. Vacasa uses cheap furniture that is uncomfortable and doesn't match the cozy beach getaway feel, things are broken and they always seem to be missing key items in the kitchen which amounts to us feeling like they don't really care. Your company is much more thoughtful and we hope you keep up the good work :) Thank you for a fun and relaxing get away! This property is very well located near a beautiful beach, the condo was a perfect layout and size for the four of us. Everything was in good condition, and very clean.. Even the knives were sharp! There was an excellent selection of games, DVDs and books and TV for movie watching and music. We always enjoy coming to Cannon beach / Oregon coast. Always nice to get coffee beans and treat bag for our dog. Very relaxing. We've stayed in a lot of vacation homes, and this one was by far the cleanest one! It had so much space, and was only a few blocks from the beach. It was so nice! Everyone was very nice and so accommodating. We enjoyed our stay at the Purdy house. Although the bedrooms were very small and the one bathroom was tight, it suited our family just fine. I mean, how much time do you really spend in the bedroom or bathroom when you have a beautiful view right out the front window? We appreciated a unit that allowed us to bring our two small dogs as well. 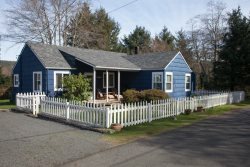 The whole family enjoyed our stay and we would definitely rent the Purdy house on our next visit to Cannon Beach! Fantastic, I think it's perfect for a couple to get away for awhile. The most relaxing and wonderfully lazy weekend both myself and our friends have had in a long time. Thank you again for thinking of everything.